Spring Skiing special - DOWNTOWN LAKE PLACID RIGHT ON MIRROR LAKE ! For the Spring, Summer and early Fall I am renting the whole unit as described below with a minimum 2 day rental. FOR THE WINTER (up here it is November 1st To APRIL 30th) - I am just renting one floor as the bottom floor I close down for the Winter. It is available for just one person or a couple. It is perfect for skiers, skaters or just a get away weekend. Please remember I am just renting to one person or a couple(as there is just one bed and I don't want people crashing on the floor or couch - as I want to keep it organized that way). 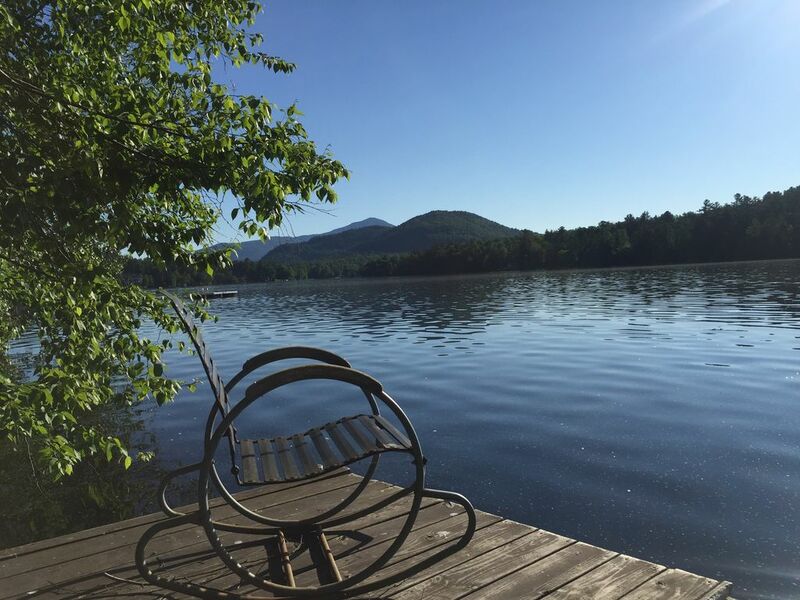 Private Dock and Adirondack Lean-To right on Mirror Lake! During the Spring, Summer, Fall this is perfect for one to four persons. This rental unit is in a commercial building right downtown Lake Placid below the commercial space(which is rented to a Coffee Shop w/ hours of 7 to 5 - so you might hear a little traffic and minor happenings during those hours above the unit - mentioned for accuracy) with a yard that leads out to an Adirondack Lean-to and Dock right on Mirror Lake - which is private and just for you the renters!!!!! Its a cool rental unit with lots of old school features including original windows, hardwood floors, exposed brick and I beams, clawfoot tube, antique Iron Beds and with an emphasis on being fresh and clean. On the shores of beautiful Mirror Lake and located in the middle of the Olympic Village of Lake Placid, this 2 bedroom 3 full size beds(WINTER TIME JUST ONE BEDROOM AND ONE BATHROOM) (the downstairs bedroom has 2 beds not fully seperated by a wall but a common area), 2 bath unit (the whole unit is on two levels and you have to go thru the porch and down the outside stairs to the second bedroom) provides it all - swimming, skiing, ice skating, pristine mountain lake, views of the lake and high peaks including Whiteface Mountain, excellent fishing, wildlife w/ frequent visits by Loons, beautiful sunrises and convenient to walk to all the restaurants, shops and local attractions. Right in the middle of downtown w/out feeling like you are. Fantastic location filled with charm and character! Mark was a pleasure to rent from. Super easy check in and the place was clean and warm (-25 when we were in town). You can't find a better location in town. We'll be back again! Great property. Mark was really nice and helpful. Some other reviewers mentioned the noise from the coffee shop above, you do hear some footsteps and water running through pipes but its not too bad at all. Would definitely stay here again. The apartment was cute and we loved being right on the lake. The shops were at our front door and the lake was out our back door. The only negative was the sound of the water going through the pipes downstairs. On the morning of the Half Ironman the coffee shop opened at 4:00 so it was pretty hard to sleep with the noise. Thanks for the review and that won't happen again - as we only opened that day early for Ironman race which started early that one time - usually the coffee shop does not open till 7. A few friends and I stayed for Labor Day weekend. The apartment is cozy and charming. It was perfect for our group. The location is great - directly on Mirror Lake with a dock on the water and right in the middle of town. The owner was very responsive and helpful and the coffee shop he owns, right next door, was our go-to first thing in the morning. I would gladly book again. This property is perfectly situated in the middle of town making walking anywhere very easy. Fantastic coffee shop with very friendly staff directly upstairs, try the Nitro brew on a warm day. They were able to provide me with local recommendations for things to do and places to eat. The lakefront is perfect, I took the canoe out every morning for amazing views. Willy (Mark) was a very friendly and helpful host. The owner Mark Wilcox is "over the top" in customer service. Very clean and affordable with access to main street restaurants and shops. We attended Ironman competition and with all the crowds, this location was ideal. Worth the stay and adventure with a canoe and lake dock for whatever works for you- swim - fish - paddle - or just chill out. Dive off for a quick swim in one of the clearest water I have even seen. Walk around the lake - maybe 30 minutes. Great sunrise view. Another plus is the coffee shop recently opened on the street level. This shop is owned by Mark Wilcox and provides another plus. Parking is a challenge but convenient lots across the street (50 cents an hour) and another daily lot - $5 a day is available.